As most of the common wheel bearings have plastic or fibre cages that may not be resistant to fuel oil, this can be a costly mistake. We always recommend the use of a steel cage in an engine/gearbox application. The only plastic type crank cage we supply in this style, is for the 70′s TZ Yamaha, but these are special reinforced, petrol resistant material and were designed to be replaced often. For crank applications, NTN/SNR have developed -9T cages which have a black appearance. These have a special coating that provides increased strength and aids lubrication under severe conditions normally found in 2 stroke motorcycles. Some of the sizes we offer also use special heat treated inner or outer rings to double bearing life by hardened resistance to wear from insufficient or contaminated lubrication. In the case of crank bearing internal clearances, these are generally C3 or C4, which signifies larger than standard clearance. These are ranges dependant on bearing size and are there to allow the bearing races / balls to expand when used in high load or temperatures. 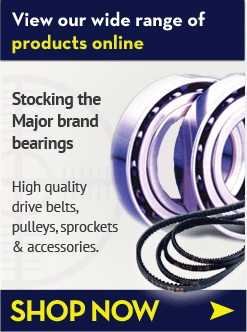 There are also certain bearings manufactured to specially tightened clearances to reduce noise levels. NTN/SNR supply approximately 45% of the Japanese Original Manufacturers market and have many European motorcycle (or component) customers such as Triumph, Piaggio, Rotax, Showa.